Revised Nineteenth Edition 1971 – Softcover – 220mm x 140mm – 584 pp – 15 colour pages. Published in Waseca, Minnesota by Herter’s, Inc.
George Leonard Herter – Professional Fly Tying, Spinning and Tackle Making Manual and Manufacturers Guide. The pages in the paperback version are only held in place by glue so be sure to check there are no pages missing. 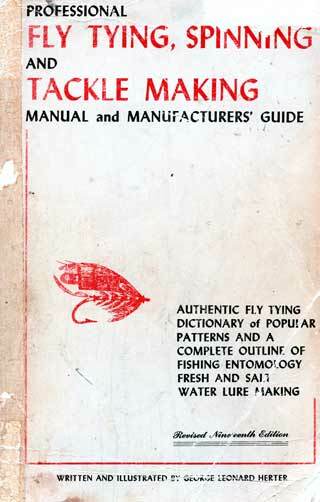 Professional Fly Tying and Tackle Making Manual and Manufacturers’ Guide by George Leonard Herter was first published as early as 1941. Originally it was called the Complete Fly Tying Instruction Book and had 119 pages. Over the years the book was constantly expanded and improved. It covers an amazing range of subjects, so many and varied that I have decided to include the full index so you’ll get some sense of the scale of the book’s contents. Surprisingly, George Herter’s book often goes unnoticed and unlike many angling classics, the paperback version can be purchased for a very modest sum of $10.00 or less. The hardcover version of course rightly sells for about $50.00 plus. There are a couple of odd things about this excellent book. Firstly, the chapters are not listed at the beginning of the book but are instead included in the index at the back. Although the page numbers are included for the 37 chapters, the subject pages themselves are not numbered, or at least this is the case in the edition that I have. I understand there were many changes over the years so not all editions will be the same. Secondly, I have the paperback version which is not stitched in any way. The pages are held in place by what appears to be PVA glue down the spine. As a consequence, the pages are vulnerable to becoming loose and falling out. Be aware that you’ll often see paperback versions for sale that have pages missing for this reason. Despite the long-winded title Professional Fly Tying and Tackle Making Manual and Manufacturers Guide, Herter’s book is mostly about fly tying, methods, techniques, and materials in great detail that I’ve not seen covered elsewhere. It is wonderfully illustrated throughout. 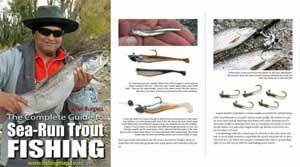 Professional Fly Tying and Tackle Making Manual and Manufacturers Guide is a wonderful angling classic. Any fly tyer, in particular, will not be disappointed on purchasing this book. You’ll find endless enjoyment within its massive 584 pages. Copies are usually available on Amazon. Do Fish Have a Memory? Daylight Fluorescent Paints and Lacquers? What Fish See Can Fish Smell? D0 Fish Have a Sense of Taste?